Theresa May headed off to her final PMQs of 2017 on Wednesday, and was in resilient form as she swapped verbal spars with the leader of the opposition, Jeremy Corbyn. The Prime Minister traded blows with Labour’s leader, including one jibe where she reminded him that she was still PM, despite his prediction some months ago that he would be in Number 10 by Christmas. Late evening came, and news broke that Damien Green, a long trusted ally of May, had been sacked from his cabinet post, yet, unlike previous cabinet upsets this year, the expected flurry of immediate calls for Theresa to go has yet to prove vocal. December finds her personal position stronger, her grip on Number 10 tighter. Corbyn’s own predictions about when he will come to power have swung wildly in the past year. 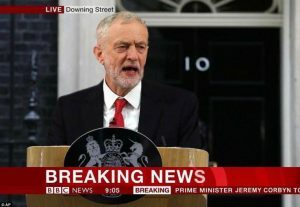 Speaking earlier this week, he produced his latest claim; telling his audience that within the “next twelve months”, Labour will “probably win a majority” at a general election. His forecast sounded confident, but the reality is it harks back to a string of predictions from the man heading up the parliamentary opposition to Theresa May’s government. This latest declaration is from a man who over the summer predicted the PM to be gone by Christmas, her government in disarray. Indeed he went as far as to tell the organiser of Glastonbury festival back in June 2017 that he would be Prime Minister “in six months”. It is a disappointing reality for Mr Corbyn and his supporters that this is most certainly not the case, he has never looked like threatening the Tories’ grip on power in recent weeks, and this – his latest timeframe – must be taken with a significant pinch of salt. A man who repeatedly called for Theresa May to step down after the Conservative party returned the greatest number of seats in the 2017 General Election, his frequent calls for concession of his opponent are beginning to sound desperate. As we head towards the year end, however, this latest – and extended – prediction by Corbyn, tells us two things about May’s own position heading in to 2018. Firstly: it shows us the security of her position. Corbyn is producing the same rhetoric he has been providing for over six months now, he continues to call for May to go and to predict his own rise to the top job. Yet, the reality is, there has been no inclination of May being toppled by the Labour party at all during her tenure in the job. Indeed, the most significant crises to face the PM have all be caused by internal Tory strife and disagreement, and if she continues her upwards trend of getting her own house in order as it were, it appears likely that there will be little threat from Labour as we enter 2018. As such, Corbyn can and will continue to produce soundbites, but as of yet there remains no credible Labour threat to May’s position. Indeed, what we see secondly in Corbyn’s comments, is the reality that her position is actually strengthening. In comparison to the drama and tension surrounding the November cabinet losses of Priti Patel and Michael Fallon, this latest minister to go has caused far less upset to the government. It may well be a personal loss to May seeing such a close friend and ally go down in disgrace, but politically it has damaged her far less. Clearly her opponent realises her strengthened position, recognising his own need for far longer to attempt to topple her government! 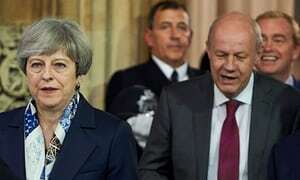 May has not been further weakened, rather further strengthened, by the continued dramas and political turmoil to have unfolded around her in the past few months. As we head towards Christmas and the New Year, May faces a headache of who to appoint as the replacement for Damien Green, but she has little worry of Corbyn pinching her job, and even less of her government collapsing.